Blue Sky User Profile: Gradient Effects | abluesky.com : Audio Design Labs Inc. Located in Marina Del Rey, California, Gradient Effects has delivered dynamic visual artistry for feature films and other forms of entertainment since 2006, offering a complementary suite of services for CGI design, pre-production, on-set supervision, digital intermediate and post-production. Founders Thomas Tannenberger (Visual Effects Supervisor) and Olcun Tan (Visual Effects Supervisor/Head of R&D) lead a talented team of artists and developers committed to creating breakthrough visual effects quickly and economically. 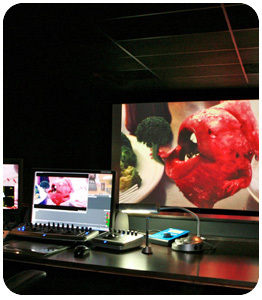 Founders Tannenberger and Tan wanted to transform an unfinished room into a complete digital intermediate suite within the Gradient Effects facility. As part of this a complete Blue Sky Big Blue 5.1 monitoring system was installed in the studio. Specifically, this included three SAT 12s and one SUB 15 Universal. An additional four I/ON (in-wall/on-wall) passive studio monitors were installed in the sidewalls, serving as the surround channel monitors.